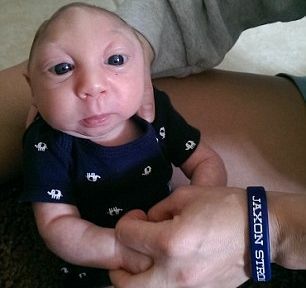 TAVARES, Fla. — The parents of a now one-year-old boy who was born without a skull recently addressed their critics who assert that the couple should have chosen to abort their child because of his medical condition. Brandon and Brittany Buell believe that their son Jaxon is a miracle. He was diagnosed with a rare condition known as microhydranencephaly while in the womb, a condition that he was not expected to survive past a few days. Doctors advised the Buells to abort Jaxon, who at the time was 23 weeks gestation, but the couple refused because of their Christian faith. Last month, Jaxon defied the odds in celebrating his first birthday, and on Saturday, his father took to Facebook to both mark the milestone and address the critics who claim that Jaxon should have been aborted. Buell began by explaining that his son is just like any child. Buell also addressed the critics who have condemned the family for not aborting Jaxon because of his medical condition. “Jaxon was our baby, and we only had one shot to do everything we could for him. We would never choose to play God in that situation, when we had been given a child, and it was our job to give him a chance to live,” Buell continued. But despite the naysayers, the couple has also received much support, garnering nearly 100,000 Facebook likes and raising nearly $60,000 for their son’s medical bills. “[W]e will never understand how anyone could ever have a negative or hurtful comment to say about an innocent special needs child, but those poor souls are by far the minority, and they should see our inbox from the masses who love our son, our family, his story, and are inspired by him because he continues to fight and because we chose life in the first place,” Buell said. He stated that he believes Jaxon’s story will benefit the medical world as the family plans to work with some of the leading neurological teams in the country, and that others who will walk a similar path will be encouraged by their son’s life as well.